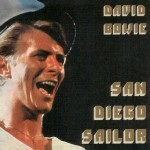 David Bowie 1978-03-29 San Diego ,Sports Arena – San Diego Sailor – (blackout). 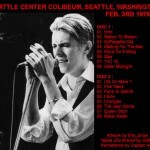 The show itself is a good performance all around, Bowie remembers just about all the lyrics (good for Rock N Roll Suicide). The taping crew is funny, belching into the mike during Be My Wife, and again weighing in during the band intros “appearing soon, the Gordon Stewart space band…..” maybe Gordon was one of the tapers, who knows. I also like the opening night delays between songs, noticeable during the intro to Blackout and the Jean Genie, where Bowie says “Good Evening” before launching into Jean Genie, something he didn’t do in other shows. 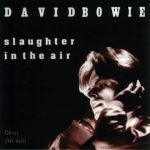 On my copy there are a few nicks here and there, but nothing bad, Soul Love is missing about 30 seconds in the middle of the song which was probably a source tape cut/flip, Five Years suffers from some pretty decent warble, and Beauty and the Beast is shortened, as is Station to Station. I think these are just short versions not cuts. So try to bear with the quality and enjoy this show for what it is, until something better hopefully comes along. I am still hopeful that someday an upgrade may show up, or the Fresno show from April 2, or even a better copy of the Forum show from April 6th. These early tour shows are always unique and a fun listen. This Rock N Roll Suicide is very nice. I was at that show at the San Diego Sports Arena on March 29th 1978. After wards met David and Sean Mayes at the Harbor Island Hotel ( Now called the Hilton ) and watched David perform (4) songs on the lounge stage. Does anyone have photos from that night? Someone must. Thanks.